This is the first part of a post co-written with Thierry De Baillon from Sonnez en cas d’absence. Read the second part here. We live in an age where emergent technologies continue to have massive effects on business and society. Rising complexity requires companies and economies to cope with increasingly interlocking systems. If we keep on considering systems in a traditional, isolated way, this would lead to a totally locked view of business. This new hyper-connected nature of information entails an unprecedented change in business and societal environments. One major consequence for companies is the imperative to learn to anticipate those changes as well as to successfully adapt to them, or being at risk of disappearing. The life time of business models is declining. Organizations are forced to reinvent themselves more and more frequently in order to survive and thrive. This implicates the creation and pursuit of new businesses while maintaining and improving existing businesses – sustainable success depends on a proper integration of evolutionary and revolutionary innovation. 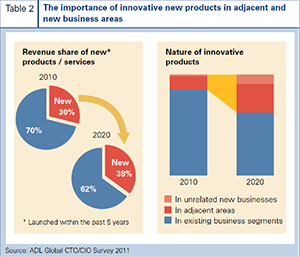 A recent Arthur D. Little study has found that the proportion of innovative new products in adjacent and new business areas is likely to be nearly 3x as big as it was in the last decade (figure below). Such an increase would have fundamental consequences for the way innovation is managed. These radical innovations typically entail the search of new business models and strategies in order to scale them. 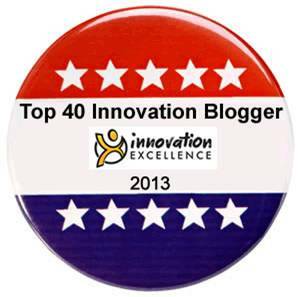 Furthermore, the latest IBM 2012 Global CEO Study, titled “Leading Through Connections“, indicates that there is no significant difference in their approaches to product and service innovation when comparing outperformers with underperformers . Where they differ is in their approach to business model innovation. Outperformers tend to upset entire industries. According to the following figure, they are 48% more likely to break into other industries and twice as inclined to invent entirely new ones. Tom Hulme from IDEO puts it in a nutshell: The business model is the new unit of design. Confronted with growing complexity at every turn, organizations are finding it increasingly impossible to be successful when entirely executing on their own. In order to move along innovation s-curves more effectively and efficiently they aim at building appropriate open value networks. Another finding of the IBM Study confirms outperformers to be more inclined to innovate with external partners (figure below). There seems to be a clear tendency to leverage openness, connectedness and collaborative innovation for the successful creation of novel business models. 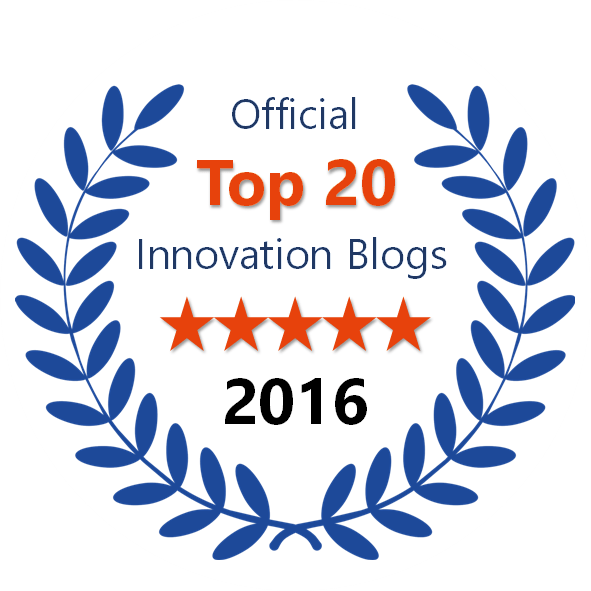 Obviously, cocreation with partners, who may even be competitors, gives outperformers the edge to tackle the most challenging forms of innovation. (Re-) Combination of internal and external capabilities to create value across boundaries is becoming crucial for organizations to succeed. Finally, co-creation also expands the canvas of creativity, such that organisations need not restrict their innovation endeavors to those core competencies they already have a proven track record in. If they lack the expertise to plumb the depths of a certain arena, they can “acquire” it by simply co-building such expertise and insight with the right organisations. It’s a win-win situation. To conclude we believe that co-creating products, services and solutions that cater to specific needs of the stakeholders is the only way we can build our enterprises of tomorrow. As previously outlined, organizational reinvention by entering new businesses requires a different approach than sustaining existing businesses. Unlike exploitation of existing business models, exploration of new business models follows an emergent strategy through iterative testing, adjustment and validation. In most cases both customer problem (job-to-be-done) and solution (viable and feasible business model) are yet unknown at the outset. Therefore, matching them entails an open-ended search process without predefined goals. Due to interactions and interdependencies among diverse stakeholders with different values and perspectives (such as customers, R&D, finance, management, shareholders, suppliers, sponsors etc. ), this process of creating and implementing a novel business model while maintaining the existing model exhibits features of a wicked problem. Wicked problems are the opposite of complicated -but ordinary- problems that can be solved in a defined time by applying standard analytical methods. Transitions between different business models can also be regarded as complex adaption processes aimed at responding to fundamental changes in the business environment. Experimentation and agility: In complex and uncertain environments it’s essential to let patterns emerge and to determine which ones are convenient. Every experiment exposes new aspects of the problem, leading to further adjustments of the following solution proposal. In place of finding ‘the right solution’, problem understanding and solution must be woven together from beginning to end through explorative iterations. Interpretive approach: A wicked problem usually implies a radical uncertainty, i.e. not simply an inability to predict which of several options will turn out to be the preferred one. In the absence of a specified solution, no analytical problem solving can be applied by breaking the problem up into a set of separable parts that can be assigned to different specialists. An appropriate approach aims at initiating and guiding among stakeholders in order to allow insights and shared understanding to emerge. Or as Harold Jarche puts it: organizations need to extend the notion of work beyond goal-oriented collaboration towards opportunity-driven cooperation. Diverse ecosystems: Given that many people care about or have something at stake in how the problem has to be / could be resolved, the process of solving a wicked problem is fundamentally social, and solving a wicked problem is fundamentally a social process. Emergence is self-organization, order that bubbles up from the bottom instead of being pushed down from the top. Emergence is common in complex systems where agents have the autonomy to move around and interact to discover possibilities. For emergent strategy to be successful, there must be enough autonomy, freedom, and slack in the system for people and resources to connect in a peer-to-peer way, like they do in Silicon Valley. Taken together, this makes an important point: Emergent strategies and tackling wicked problems, such as business model innovation, require appropriate social and engaging business environments in order to thrive. 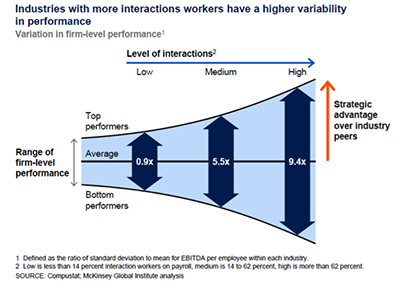 Findings by the McKinsey Global Institute further confirm: the greater the relative percentage of interaction workers (i.e. employees whose work requires complex interactions with other people and independent judgment) in an enterprise, the more competitive it is within its peer group. This suggests that solving the challenge of making interaction workers more efficient and effective, should build a significant strategic capability for innovation and adaption to changing conditions (figure below). Business needs to become social. Tim Kastelle points out the foundation to make social business work: “If you want to make your organization more social, it requires tools and culture to work together. Tools by themselves will never fix your problem. 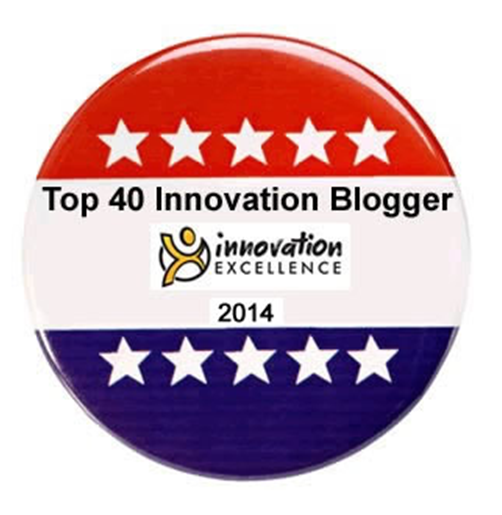 “ They need to be embedded in a culture of openness, trust and shared purpose. Obviously, social business’ adaptive and collaborative nature presents us with novel and actionable frameworks to tackle strategic and innovation issues, as we will outline more in detail in the second part of this post. An ever increasing pace of change leads to a decrease in life time of operating business models. Companies are therefore forced to reinvent themselves more frequently by creating new business models. Entering new businesses through open business model innovation exhibits a wicked problem structure. In order to properly address those problems, companies have to follow emergent strategies and need to put decentralized, self-organizing structures in place. Social business brings an answer to the urgent necessity to successfully tackle corporate reinvention and to enhance strategic adaptability by connecting individual human stakeholders.